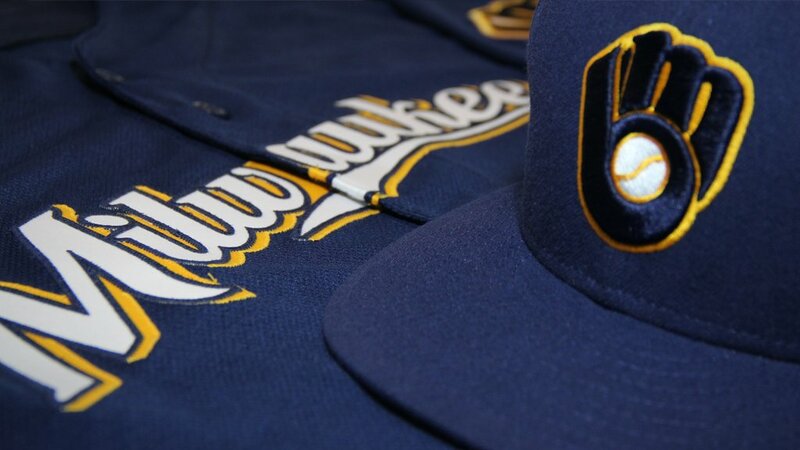 The Milwaukee Brewers are bringing a touch of class back to Major League Baseball. On Tuesday of this week, the Brewers announced that the club is going to sport the old-school ball and glove logo, to be featured on their alternate jersey rotation. Let’s take a look at the jersey and cap combo, and jump right into the analysis! Wow. Just look at the simplistic beauty. Starting with the jersey, we see class and tradition. The gold color accents the “Milwaukee” lettering just perfectly. The blue consumes the jersey, giving it a comfortable and warm feeling. With the gold accent, the lettering really pops out at the viewer. It isn’t too strong of a color, and just adds enough contrast to really set the jersey off. And while the jersey is absolutely wonderful, the true star of this uniform is the ball cap. This old-school logo was previously a part of the retro outfit for the Brewers, but now that it is added to their alternate uniform rotation, fans will get to see this logo almost weekly. That’s a definite treat for Milwaukee fans! So let’s jump right in to this glove and ball logo. Honestly, I smile every time I look at it! At first glance, it’s so simple. A ball and a glove. What a breath of fresh air, in comparison to some of the more complicated MLB logos! It looks like this team got back to the basics, and really made a connection with the fans. But when you look harder at the retro logo, you see more than just a traditional ball and glove. It’s an “M” and a “B” that make up the glove. The Milwaukee Brewers definitely got their money’s worth with this one! Cleverly designing the glove with the team’s initials was brilliant! I am truly digging this look. I can’t wait to watch Milwaukee wear it in action! You know who else you should see in action? The Cape Cod Baseball League. Cape Cod will fill your belly with amazing seafood, and fill your heart with amazing baseball! If you are a true baseball fan, you need to go see this league. The best part is that it’s free to sit in the stands. They pass around a hat for donations. It doesn’t get much better than that. Some serious major leaguers have come through the Cape. We’ve blended these two passions to form the Cape Cod Scrod. A Scrod is a small cod and if spelled Schrod, it could be a haddock. Either way, it’s delicious, as is this logo. Enjoy this Cape Cod sports logo t-shirt. This would make a great selection in our T-shirt of the Month Club. Posted in Baseball by Gavin on 1/30/2016 at 9:56:19 pm.